In June 1914, the town of Salem, Massachusetts was the site of a massive fire that destroyed over 1,300 buildings. Three and a half years later in Halifax, a fire aboard the SS Mont-Blanc caused an explosion that killed approximately 2,000 people and injured 9,000 others. These two events may seem completely separate in both time and location, but comparing the responses to the disasters sheds an interesting light on the nature of relief efforts and the connections between people living in the United States and Canada. In the case of Salem, which was home to a sizable francophone community, there wasn’t much coverage of the fire in Quebec. The Halifax explosion, on the other hand, received plenty of attention in Boston, where residents had significant ties to Nova Scotia. The way in which each disaster was met, both locally and abroad, presents not only a unique opportunity for transnational history, but also serves as a fascinating comparison of how citizens respond to disasters. 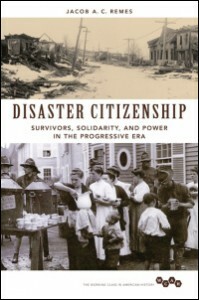 In this episode of the History Slam, I talk with Jacob Remes about his new book Disaster Citizenship: Survivors, Solidarity, and Power in the Progressive Era. We talk about doing trans-national research, North America diaspora, and responses to disasters.